This in-town, award-winning boutique hotel offers a luxury experience at a better value. 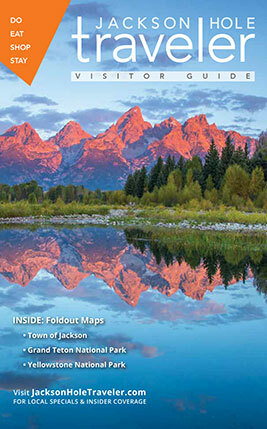 When choosing Jackson Hole as a vacation destination, selecting the right lodging is key to a successful trip. You may decide you want to feel more than a little comfortable—and perhaps pampered—in sophisticated accommodations at a luxury hotel centrally located in downtown Jackson. If so, look no further than this TripAdvisor 2017 Traveler’s Choice: Hotel Jackson. If you’re hoping for an extraordinary, boutique hotel stay in Jackson Hole, then Hotel Jackson is the answer to your dreams. Situated just one block from the renowned and lively Jackson Town Square—where all the best shops and restaurants are—Hotel Jackson is the town's only Forbes four-star, AAA four-diamond and TripAdvisor Traveler’s Choice award-winning property. Additionally, it is locally owned and operated. Built to LEED standards—elements of Western history are on magnificent display in the rustic, reclaimed barn wood used throughout the hotel. In fact, there is an astounding 26,000 linear board feet of this beautiful wood in the building! This special and unusual attention to detail is also reflected in the custom made furniture and carpets, onyx light fixtures and the sunny lobby’s handmade chandelier which echoes aspen leaves. All artwork found in the hotel is from local galleries and artists. Hotel Jackson features 55 spacious guest rooms with one King or two Queen pillow-top beds, including four well-appointed suites. Each unique suite has enviable views of either Snow King Mountain or Saddle Butte. All guest rooms and suites include a natural gas fireplace, flat-screen HDTV, a Nespresso machine, a reading nook and more upscale niceties. Even the luggage racks are nontraditional and sumptuous, made out of the finest leather. Multiple Amenities—Including the Sacajawea Library! The Hotel Jackson experience is replete with thoughtful and unique amenities for its guests. These comforts and conveniences include a complimentary ski shuttle in luxury vehicles to and from Jackson Hole Mountain Resort; on-site ski and boot fitting; a rooftop spa; fitness center; free hi-speed WiFi, and even a complimentary daily cookie break! But perhaps the most unrivaled amenity is the Sacajawea Library located off the lobby; a unique aspect to any other hotel in Jackson. Inspired by Jackson Hole’s own Kenneth Thomasma—a former local educator and author of myriad books on Native Americans—this well-appointed library includes a diverse, extensive collection of books by local authors and about the region. Plush leather chairs and couches, Native American and Western artwork and sculptures enhance this impressive and historical sanctuary. Amenities: Natural gas fireplaces, flat-screen HDTV and Nespresso machines in each room; complimentary ski shuttle to and from Jackson Hole Mountain Resort; on-site ski and boot fitting; a rooftop spa; fitness center; two in-house restaurants and more. The hotel boasts not one, but two restaurants under its roof: the authentic Lebanese cuisine of FIGS and the seasonal, outdoor eatery, Smokin’ Iron. In addition to serving up the authentic flavors of Lebanon, FIGS features a handmade, two-story, steel wood-burning fireplace. FIGS restaurant and lounge serves three meals a day and is also place in which guests can simply hang out and relax. The only restaurant of its kind in all of Jackson Hole, FIGS offers diners dozens of choices of plates to share, including delicious kebabs, several different hummus presentations, fresh salads, flat breads, vegetarian and vegan options and handcrafted cocktails at the copper-top bar. Open from mid-June through mid-September, Smokin’ Iron is a popular spot for both locals and visitors alike. At the open-air restaurant you will find “Wyoming Fare” to indulge your palate with, such as elk or buffalo brats, traditional, spicy or barbecue chicken wings and burgers. There are also fun drink options with full size drink flights and eight beers on tap. Nightly music from a local musician enhances the whole experience. Hotel Jackson provides a bespoke lodging experience, with an attentive and friendly staff that is able to curate your Jackson Hole activities; no request is too small. Because of the hotel’s central location—mere steps away from the best dining, shopping and art galleries in Jackson Hole—and access to both Jackson Hole Mountain Resort and Snow King Mountain, it’s the perfect spot for people to base their trip to our valley. Hotel Jackson is only two years old and the kudos it has received from Forbes, Triple A and TripAdvisor are unprecedented for such a new hotel. In fact, the accolade from TripAdvisor places it among the top 25 hotels in the nation. That all means Hotel Jackson will provide you with an unmatched accommodation choice during your stay in the Tetons. For reservations and more information call 307-733-2000, or visit hoteljackson.com.